Establishing NOx Emission Control Areas would significantly reduce ship NOx emissions by 2040 – introducing economic instruments could cut emissions faster and further. A new study has given projections of ship NOx emissions in the Baltic Sea, the North Sea and the English Channel up to 2040, and estimated the potential of various measures to reduce NOx emissions from international shipping. Ships emit significant amounts of air pollution, including sulphur dioxide (SO2), nitrogen oxides (NOx) and small particles (PM2.5), causing serious damage to health and the environment. As a result of both EU and global regulations, sulphur emissions from ships are expected to gradually come down, but there is currently no regulation that will ensure any significant cuts in their NOx emissions. The only existing regulation of NOx from international shipping is in Annex VI of the MARPOL Convention under the International Maritime Organization (IMO). However, the NOx emission standards in this regulation solely apply to newly constructed ship engines, and the currently (since 2012) applicable Tier II standard accomplishes just a modest 15 to 20 per cent emission reduction compared to an unabated Tier I engine. There is however a stricter Tier III standard that requires emission reductions of about 80 per cent compared to a Tier I engine, but this applies only to newly built ships in designated NOx Emission Control Areas (NECA) which currently only exist in North America. While the Tier II standard can be achieved by internal engine modifications that adjust combustion parameters, bigger changes are needed to reach the Tier III standard. Exhaust gas after-treatment, where the main option is selective catalytic reduction (SCR). Combustion modification using techniques such as exhaust gas recirculation (EGR) or methods where water is introduced in the engine. Switching from marine fuel oils to, for example, liquefied natural gas (LNG) or methanol. Reduced fuel consumption, e.g. through slow steaming. According to the study, SCR, EGR and using LNG as fuel can all reduce NOx emissions to Tier III levels. Of these, SCR has the longest history of marine applications, LNG is increasingly being used as a marine fuel, and while EGR is said by engine manufacturers to live up to the standard, so far there is limited data from practical applications. In terms of costs, EGR and the SCR have comparable costs per kg of NOx reduced, while the costs for LNG depend largely on whether an existing ship is rebuilt or the LNG system is installed on a new ship – the latter being considerably less costly than the former. Fluctuations in the LNG price also affect the potential return on investment. In order to analyse the potential for reducing NOx emissions from shipping, the study made new projections of emissions up to 2040 in the Baltic Sea, the North Sea and the English Channel. Regarding activity levels, ship traffic was assumed to increase by 1.5 per cent per year for all ship types except container ships, where the increase was set at 3.5 per cent per year. The average lifetimes of ships were assumed to stay the same up to 2040, i.e. 25 to 28 years. Expected improvements in transport efficiency will result in lower fuel consumption for comparable volumes of freight transport, and in this study efficiency is assumed to increase between 1.3 and 2.25 per cent per year for the different ship types. The authors point out that these values are quite optimistic and result in fuel consumption that is stable over time despite an increase in ship traffic. Projections were given for two scenarios – one business-as-usual (BAU), i.e. with no NOx Emission Control Area (NECA), and another with a NECA in place from 2021. Current (2015) emissions were estimated to amount to 830,000 tonnes of NOx. Under the BAU scenario, emissions in 2040 are expected to come down by about 14 per cent, to 715,000 tonnes. Assuming that a NECA is in place from 2021, emissions in 2040 would instead be reduced by nearly two-thirds, to 306,000 tonnes. In addition to estimating the impact of a NECA, the study evaluated several policy instruments that could be implemented in addition or as an alternative to the NECA. These policy instruments would address NOx emissions from the entire fleet, not only from newly built ships. The first option is a levy that ships have to pay for NOx emissions in the area. The revenue from the levy would be used to fund the uptake of NOx abatement measures in the sector. The second option requires ships to reduce their speed by 15 per cent under the baseline speed when sailing in the area. As an alternative compliance option, the ships that prefer to stick to their baseline speed can pay a levy, depending on their NOx emissions in the area. The income from this levy would be used to fund NOx abatement measures in the sector. The third option is a stand-alone levy that ships have to pay for their NOx emissions in the area. The revenue from this instrument is assumed to go to the member states and not to be earmarked. These three instruments were evaluated regarding their NOx reduction potential and the associated costs for the sector if the levy rate was either set at €1, €2 or €3 per kg NOx. It was found that two of the three instruments were better at meeting the two criteria, firstly a levy & fund and secondly regulated slow steaming combined with a levy & fund. Introducing a levy & fund instrument could quickly and significantly reduce ship NOx emissions. In 2025 emissions could be cut by two-thirds (67%) in the case of no NECA and by 61 per cent with a NECA in place (see table). 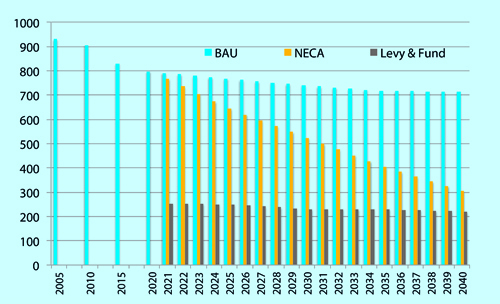 In 2040, reductions would amount to about 70 per cent in the absence of a NECA, and about 30 per cent if a NECA is established. This is roughly twice the reduction achieved with regulated slow steaming combined with a levy & fund if the baseline speed is reduced by 15 per cent. However, costs for the sector of a levy & fund are also roughly twice the costs of regulated slow steaming combined with a levy & fund. Table: NOx emissions from international shipping in the Baltic Sea, the North Sea and the English Channel 2005–2040 (thousand tonnes). Expressed in tonnes, this means that even with a NECA in place, the use of economic instruments could cut annual NOx emissions by about 400,000 tonnes on average throughout the 2020s. For comparison, this is more than the total land-based NOx emissions of Sweden, Denmark and Finland combined, which in 2014 amounted to 385,000 tonnes. Because the Tier III NECA standard applies only to newly built ships and ships have a very long lifetime, the introduction of economic instruments such as a levy & fund would provide a very useful complement to the NECA, by also ensuring significant emission cuts in the short term. Assume, for example, that a levy & fund is adopted and put into practice in the Baltic Sea and the North Sea in 2021, this would achieve an accumulated additional emission reduction over the ten years up to 2030 amounting to nearly four million tonnes of NOx. The study “NOx controls for shipping in EU seas” (June 2016) was commissioned by Transport & Environment and prepared jointly by the consultants IVL Swedish Environmental Research Institute and CE Delft. Figure: NOx emissions from international shipping in the Baltic Sea, the North Sea and the English Channel 2005–2040 under a) business-as-usual (BAU); b) a NOx emission control area (NECA), and; c) a NOx levy and fund system. •Nickel and vanadium in PM10 are indices of shipping air pollution. •Nickel and vanadium were associated with elevated cardiovascular hospitalizations. •Nickel appeared to correspond better than vanadium to cardiovascular health. •Controlling residual oil emissions is important in port cities. Previous studies have suggested nickel (Ni) and vanadium (V) as the likely constituents that are partially responsible for health effects associated with particulate matter pollution. The authors aimed to examine the effects of Ni and V in PM10, the indices of shipping emissions, on emergency hospitalizations for cardiovascular diseases (CVD) in Hong Kong. Daily PM10 speciation data across six monitoring stations in Hong Kong during 1998–2007 were collected. Generalized additive Poisson models with single-day lags were used to estimate the excess risks of emergency hospital admissions for CVD associated with Ni and V, after adjusted for major PM10 chemical species and criteria gaseous pollutants. The excess risks for inter-quartile range (IQR) increases of Ni and V on the same day and previous six days (lag0 ∼ lag6) were estimated. Ni in PM10 was associated with a 1.25% (95%CI: 0.81–1.68%) increase of total emergency CVD admissions on the same day, while lag0 V was associated with a 0.95% (95%CI: 0.55–1.35%) elevated CVD admissions. The associations were not sensitive to the further adjustment for co-pollutants. Ni appeared to correspond better than V to cardiovascular health. Controlling shipping emissions from residual oil combustion in the port cities like Hong Kong is particularly important. Pressure is mounting on the UN’s International Maritime Organisation and the EU to tighten laws governing ship emissions following the decision by the US government last week to impose a strict 230-mile buffer zone along the entire US coast, a move that is expected to be followed by Canada. The setting up of a low emission shipping zone follows US academic research which showed that pollution from the world’s 90,000 cargo ships leads to 60,000 deaths a year and costs up to $330bn per year in health costs from lung and heart diseases. The US Environmental Protection Agency estimates the buffer zone, which could be in place by next year, will save more than 8,000 lives a year with new air quality standards cutting sulphur in fuel by 98%, particulate matter by 85% and nitrogen oxide emissions by 80%. The new study by the Danish government’s environmental agency adds to this picture. It suggests that shipping emissions cost the Danish health service almost £5bn a year, mainly treating cancers and heart problems. A previous study estimated that 1,000 Danish people die prematurely each year because of shipping pollution. No comprehensive research has been carried out on the effects on UK coastal communities, but the number of deaths is expected to be much higher. Europe, which has some of the busiest shipping lanes in the world, has dramatically cleaned up sulphur and nitrogen emissions from land-based transport in the past 20 years but has resisted imposing tight laws on the shipping industry, even though the technology exists to remove emissions. Cars driving 15,000km a year emit approximately 101 grammes of sulphur oxide gases (or SOx) in that time. The world’s largest ships’ diesel engines which typically operate for about 280 days a year generate roughly 5,200 tonnes of SOx. Shipping emissions have escalated in the past 15 years as China has emerged as the world’s manufacturing capital. A new breed of intercontinental container ship has been developed which is extremely cost-efficient. However, it uses diesel engines as powerful as land-based power stations but with the lowest quality fuel. “Ship pollution affects the health of communities in coastal and inland regions around the world, yet pollution from ships remains one of the least regulated parts of our global transportation system,” said James Corbett, professor of marine policy at the University of Delaware, one of the authors of the report which helped persuade the US government to act. Today a spokesman for the UK government’s Maritime and Coastguard Agency accepted there were major gaps in the legislation. “Issues of particulate matter remain a concern. They need to be addressed and we look forward to working with the international community,” said environment policy director Jonathan Simpson. “Europe needs a low emission zone right around its coasts, similar to the US, if we are to meet health and environmental objectives,” said Crister Agrena of the Air Pollution and Climate Secretariat in Gothenburg, one of Europe’s leading air quality organisations. The world’s biggest container ships have 109,000 horsepower engines which weigh 2,300 tons. Shipping is responsible for 18-30% of all the world’s nitrogen oxide (NOx) pollution and 9% of the global sulphur oxide (SOx) pollution. • This article was amended on 25 August 2015 to correct the number of deaths per year attributed to pollution from the world’s 90,000 cargo ships.